Do you shop at Myntra frequently and need your your Order at discount price? 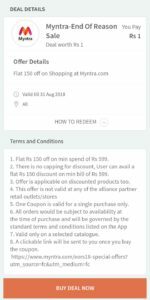 Well, Freecharge is back with an awesome offer where it is offering Deal “Get Flat Rs 150 Off on Min Shopping worth Rs 599 at Myntra” at Rs 1. So, Hurry up!! How to get Deal “Travelkhana- Get your First Meal Free in Train for New User” at Rs 1? Offer is valid on discounted product too.